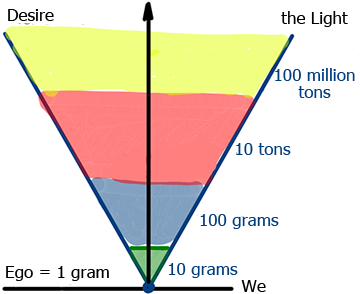 At this time, we are at a certain level of egoism, and its value, relatively speaking, is approximately one gram. Spiritual ascent makes the level of our egoism rise. At the next stage, it will be worth ten grams, then one hundred grams, then it will expand to ten tons, ten million tons, and so on. This begets the stages of spiritual growth during which the vessel, desire, increases within me, and in parallel to it I receive the Light, the property of bestowal. As a result, by climbing the spiritual ladder, we create more challenging situations, up to hatred, felt by Rabbi Shimon’s disciples in the beginning of their studies. It’s impossible to grow without going through this stage. This explains why we have to be happy when we reveal the “wicked” within ourselves— after all, we can now correct them. Question: While it happens to us, who acquires new vessels: the entire group or an individual? Answer: Only those who experience internal leaps of egoism are able to acquire new vessels. We apply a group effort that each one of us benefits from to the extent of one’s individual contribution. Subsequently, if one’s participation in general work is not enough, he receives the least out of it since he doesn’t have a “place” to accommodate anything bigger. Everything happens proportionately to the affliction we go through; there are no compromises. Our efforts are equal to our ability to absorb new portions of the Light. We can never “digest” more than we have contributed, never more than we give, since our bestowal, our straining, our desire, allows us to feel the results.